Travelling up the Thames westwards out of London is to embark on a journey into an era of grand country houses and genteel English village life. The great British poets, from Edmund Spenser to William Wordsworth, regularly went into a swoon about it; the great British painters, from Sir Joshua Reynolds to J. M. W. Turner, all had a go at depicting it. Together they celebrated it as a superb slice of the British landscape, the apogee of Englishness. And what they all tried to capture, either with words or brush, 200-odd years ago, is still there today: the view of the River Thames from Richmond Hill. “The terrace at Richmond does assuredly afford one of the finest prospects in the world,” wrote the German clergyman-travel writer Charles P. Moritz, back in 1782. He could well have written the same thing yesterday. And the timelessness and agelessness of the view from Richmond apply to virtually the whole stretch of the river west of London, from Kew through to Hampton Court. At Richmond, what particularly excited the poets and artists was the felicitous combination of the high viewpoint, the sweep of the river, the distant meadows and the riverbank trees, to which you can now add today’s more immediate surroundings of elegant cafés and boutique shopping, of course. And all along the river banks the story is the same. The reason is simple. This is where the royals, the aristocrats and the politicians of years gone by had their country retreats. And because, back then, the roads out west were rough, potholed and prone to highwaymen, they preferred to travel to their houses by boat. The Pond Garden and Knot Garden in Hampton Court Palace. The Tudor Rose on the uniform of the Hampton Court Wardens. Great Hall Hammerbeam Ceiling at Hampton Court and Interior details from Hampton Court Palace. The King’s Staircase at Hampton Court Palace. The Eel Pie Pub sign on Church Street Twickenham. A menu you can enjoy at the Bingham Hotel. Interior of the White Swan Pub in Twickenham. The idle trailing of one’s ﬁnger in the river water oﬀ the stern of a boat or even the complete cool caress of Father Thames; in this stretch, the water is clean enough for river swimming. My favored spots are at River Lane near Ham House, and up at Thames Ditton opposite Hampton Court. The river echoes with the calls of water birds: coots in the reeds, herons in the shallows, cormorants on the islands. In spring the most common sound is the concerned quacking of ducks as they set off from riverbank nests with long trails of cheeping ducklings, for their first adventure on the Thames. Riverside communities of residential houseboats add a real splash of color. Some of them comprise gleamingly varnished Dutch barges, ﬂuttering ﬂags, some of them traditional narrowboats covered in house plants. Many of their owners are artists and writers who like the freedom of life aﬂoat. An English afternoon tea – sandwiches, homemade scones, cakes, and patisserie – is something to be savored, but a tea on the balcony of the Bingham, a boutique ‘restaurant with rooms’ overlooking the river at Richmond, is really something special. Expect a proper cake-stand and a view of people messing around in boats. www.thebingham.co.uk. The White Swan at Twickenham is a real find. In a secluded location surrounded by elegant houses on the river bank, just opposite Eel Pie Island, it has its own little pebble beach and a waterside terrace with a barbecue on summer weekends, where guests might get their feet wet at high tide. Interiors are wood floors, old prints and – in the winter – welcoming log fires. It is charming, and also small so it may be best to book. www.whiteswantwickenham.co.uk. Today, land-based travel may have speeded up – key points Kew, Richmond, Kingston and Hampton are all on the London transport network – but the river is still the most compellingly scenic waterway that I know. And I do know it well; I have a little rowing boat of my own, and if you stood up on Richmond Hill for long enough, you might just catch a glimpse of me sculling up past Ham House towards Eel Pie Island, with sandwiches in the bows and a dab of sun cream on my nose. My starting point is Kew, home of the world-famous Royal Botanic Gardens. It is not just the rare species and the fine landscaping that are the big attraction here: there’s some beautifully graceful architecture, too, in the huge Victorian glasshouses, the Flemish-style Kew Palace, and the Chinese pagoda. Kew is interesting outside the gardens, too. On summer weekends Kew Green is the venue for games of cricket and summer picnics around the little pavilion, surrounded by Georgian houses and small teashops and restaurants, and Kew Bridge is where river tours begin and end. If you hop on an upriver boat here you’ll soon pass one of the aforementioned grand riverbank mansions – Syon House – which is still lived in by the original family; the Dukes of Northumberland have been resident here since 1604, although the gardens and part of the house are largely open to the public. 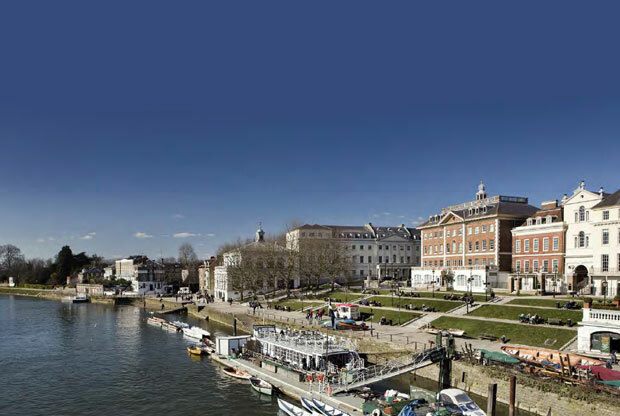 Upstream still, and a set of elegant bridges, the oldest dating back to 1777, announce your arrival at Richmond itself, for a true slice of riverside life for everyone, not just the aristocracy. Restaurants, pubs, and cafés crowd down to the water’s edge, and lovers saunter along the towpath, watching the boats come and go. Skilled boatmen work on rowing skiffs under the arches, and you can hire your own little dinghy, to continue your river meander under your own power. Upstream, with the eyes of Richmond Hill upon you, you’ll pass Marble Hill House, home of King George II’s mistress, hidden behind the trees on the north bank. More visible on the south bank is the Jacobean-style Ham House, a somber-looking place dating back to 1610, which is regularly used in films and television costume dramas, and which has a lovely walled garden in which aristocratic lovers once played hide and seek. There are still aristocrats around because next to the house is Ham Polo Ground, where bluebloods from around the world assemble to play polo, usually on summer Saturday afternoons. All are welcome to watch, no matter how highly bred. Just upriver of Ham comes Eel Pie Island, an eccentric place of unusual residences, boatyards and artists’ studios. One of Britain’s most famous inventors, Trevor Baylis, still has his workshop here. And the mainland alongside the island is studded with more palatial addresses, Orleans House and York House, the latter with a fine piece of ornamental garden alongside the river, complete with a fountain of tumbling nymphs. In the summer, there are open-air concerts here. Beyond Eel Pie, the river passes through Kingston, lined with houseboats and summer rowing regattas, before entering the last long turn up towards Hampton, around the huge gardens and grounds, and the gilded and crested wrought iron gates of Hampton Court Palace itself. Of all the riverbank houses on the Thames, this is the oldest, the most magnificent and the largest. 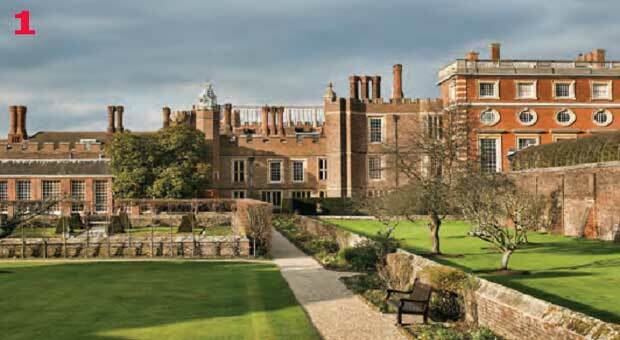 Built by a cardinal and usurped by a king – in fact by Britain’s most famous king, Henry VIII – its interiors are rich in history, and its gardens and its maze are, like Richmond Hill, legendary. It’s a destination worth reaching, at the end of a journey well made.